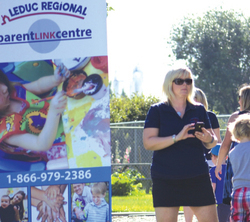 Aug. 21, 2014 6:00 p.m.
One of the more successful programs available to Leduc County and City residents has been the Leduc Regional Parent Link. This is an initiative of the Alberta Children and Youth Services that is run by the County for the benefit of residents in both the county and the City of Leduc. The program is designed to support parents in their role as their children's first and most influential teachers. The Parent Link programs are places or programs that parents can go to with their children to meet other parents, participate in play with their children and obtain information and support to help with parenting challenges. The most widely know program, this summer, has been the Play Mob gatherings held on Mondays where the location was announced at 8:30AM through social media and Leduc Radio 93.1. However, the Parent Link Centre also provides a number of additional services that includes workshops to enhance parenting skills, by providing practical tools for parents. In addition to the Play Mob program the Parent Link feature early childhood development and care drop-in programs. Parent Link has a number of family support programs such as Family Connections Home Visitation Program and Devon’s Baby and Me. Parent Link also can provide Information and a referral services where information on services and programs in your community by calling 1-866-979-2386 or contact Tonya Sabourin, the Leduc Regional Parent Link coordinator. Parent Link has a number of primary locations in each community in the County as well as one in the City of Leduc. Generally programs are provided at no cost to participants unless indicated otherwise. A newsletter and program guide is available providing information of Parent Link’s fall activities that include a variety of programs being held throughout the County and the City. On-site child minding is available for parents who require this service to attend a program. Just enquire at the time of registering.